Remember last week when my first-born lost his first tooth? Luckily it happened on a school holiday AND in the morning. I can do crafty, but rarely does it turn out to be a "short" project no matter how hard I try. All those pinterest tutorials, "20 minute pillow cover!" and the like. Sure there flap jack. I got 4 reasons, and they all start with the letter "i," that say otherwise to your 20 minute time frame. Small child interruptions, laundry, and meal times excluded...these pillows took me about 45 minutes to make for each one. I started Isaac's around 11am and finished around 8pm. That's real time! HA! With juuuuust time enough for Isaac to slide that little Chiclet into the monster's mouth as he hit the hay. He was so excited. The next morning he told us approximately 140 times before he left for school that he, "...got a paper mummy AND TWOOOO more mummys! Look at my coins!" I was pleased at the outcome. So then, because I like arbitrary goals. I decided I had to go ahead and make 3 more for the other kiddos right away. They emerged adorable from felt, scraps, 2 old shirts, and an old bathing suit of Anthony's. Does it matter that the youngest doesn't have any teeth yet? No. 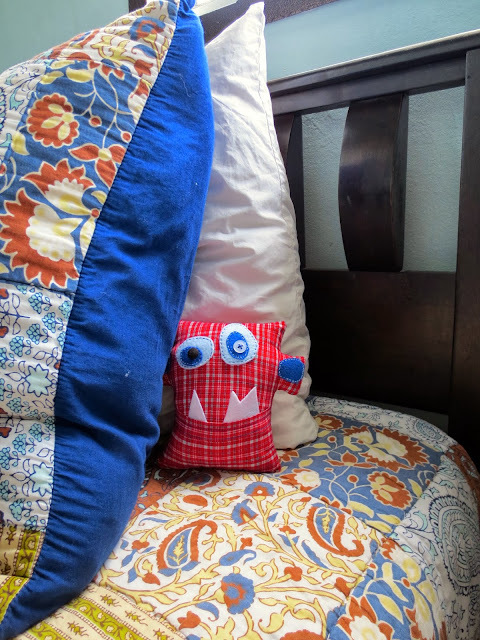 Because tomorrow she'll be losing her first tooth and I won't have had anymore time to make a Tooth Monster Pillow for her than I did this week. Speaking of. Would one of you 4 or 5 who read this blog like a Tooth Monster Pillow? * They really are easy to make and I've had fun doing so. I totally ganked the style from Pinterest. I didn't follow a particular pattern, but they look like a lot of what I perused. Since y'all come here and take time out of your day to look at pics of my adorable kids (who currently have sidewalk chalk war paint on their faces because I had to leave them "unattended" as I wrote this blogpost...the boys colored Immanuelle's face for her. Amazing, really, how well sidewalk chalk writes on faces.) and love on our family from afar, I thought someone else might want one? For your kids? 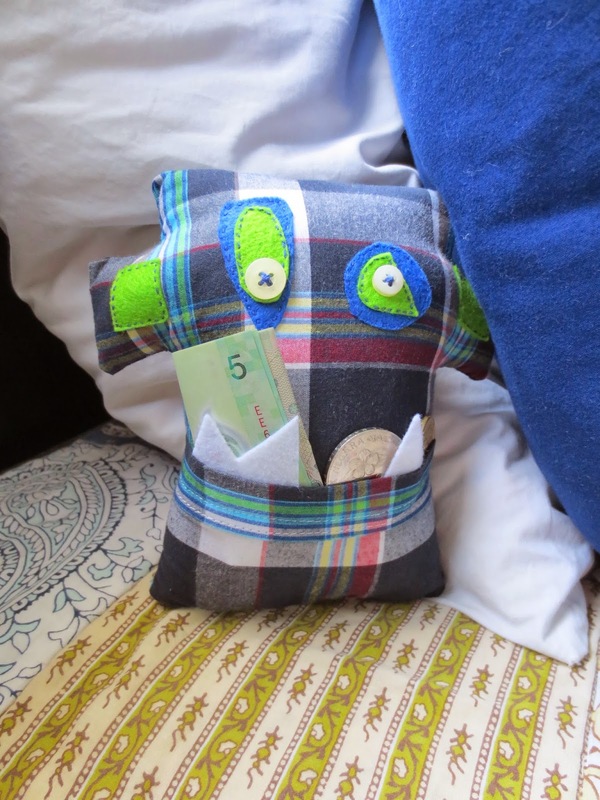 (we all shared a tooth pillow growing up) To give as a gift to the grands? Carry with you in your purse to hold your coin mummys? So. A Giveaway. Never done one before. Are there rules? Maybe. Lets try it this way. To get your name thrown in the hat, there's 2 ways. Max 2 entries per person. 2. "Share" this post on facebook. If you win I'll let you pick if you want a "girl" or "boy" monster if you have a preference...but that's all for choice, mkay? I'll choose the fabric and the buttons and what not and it'll be a fun surprise to open the package and see what turned out! Plus...a package alllll the way from **Malaysia?!? Sweet deal! *I'm nervous because what if no one cares? **Malaysia is far from America. There's no way to guarantee delivery date. If you win and you're from America and/or you live in a country that has less reliable postal systems, I apologize in advance for a) it taking forever for your package to get to you...usually around 3 weeks to America or b) never making it at all. So far that's never happened. Fingers crossed! I care! I care! I'd love a tooth monster pillow. And I'm so impressed by anyone who can sew. 1. Who wouldn't want one of these?!?! Seriously, adorable!! 2. I shared on FB. :) No funny tooth stories for me. :( Lame. I know your father and you. While I did laugh hard at your comment, I was not surprised about any of it! So, Asher's already down two teeth. Knocked them loose on those lovely Thai tile floors and then woke up a few days later with no bottom teeth. He swallowed them?!?!? His front teeth are already about to fall out (not tile, but lovely Thai wood floors) and I would love to finally play Tooth Fairy with one of your monster pillows. Adorable monster pillows! Love them, and I know the boys would too! We lose a lot of teeth in this house, so it would get well used for sure. Let's see, a tooth story...well, a couple years ago, Mike had to get a crown replaced on one of his front teeth. While the new one was being made, the dentist gave him a temporary crown--a horrible, dark-colored, misshapen one. That afternoon, Lucas had a modeling shoot (because, you know...Asia), and somehow Mike got roped into posing with him in a few of the shots (wearing a rugby shirt with scottie dogs embroidered on it, no less). A couple months later, we start seeing posters everywhere with Mike's big, beautiful, weirdly-toothed smile beaming down from them. Yeah, they photo-shopped in some snow in the pics, but didn't bother to fix the weird brown snaggle-tooth crown in Mike's smile. Mike was totally thrilled. Ha! Hey Sharon, it's Lindsey Trantham (Lindsey Andrews in three weeks from today). These pillows are so cute! I would love a pillow like this for my future littles!!! These are so cute. I have a new granddaughter that doesn't have teeth yet so it won't matter if it takes weeks to get to America. Thanks for sharing one. Super cute! I will have to try to get these made for my kiddos! My oldest grandchild is 5 and would love to have this waiting for him to lose the first tooth. So, if you choose me, I would love a "boy" monster. We care we love keeping up with the rivers! !! Funny tooth story for me was a few weeks ago the oldest came home from school and as he was telling me about his day I realized he lost his first tooth!!! As I was asking him about it I asked to see the tooth and in typical boy nonchalance he says o I left it at school... when I explained he had to have the tooth for the tooth fairy he was crushed so we wrote the tooth fairy an I owe you!! !